Gather your friends to play the trivia game that started It all! These trivia games feature 6 question categories which vary by theme. When a player lands on a category space, they'll earn the corresponding colored wedge if they answer the question correctly. The first player to collect 6 different colored wedges and answer a final question correctly wins! 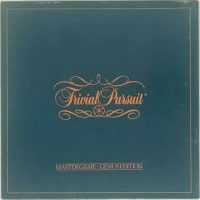 Add a Review for "Trivial Pursuit – Main Area"